With crystal and metal accents, this contemporary table lamp is equipped with eye-catching, radiant style. Three stacked, clear crystal globes form the base of this exciting modern table lamp. A faceted square base adds charm and additional sparkle while a white drum shade completes this enchanting look. 26" high overall. Shade is 13" across the top x 16" across the bottom x 10" high. Uses one maximum 100 watt standard-medium base bulb (not included). On-off socket switch. Clear crystal table lamp from the 360 Lighting brand. Three crystal balls and a rectangular crystal pedestal. Silver finish metal pole and other accents. White tapered drum shade with decorative finial. Style matches my pole lamp. The one I have now is not tall enough to read under. 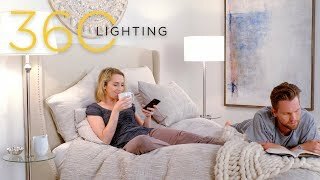 I chose this lamp because I already have another one just like it and it's absolutely gorgeous! I've had it for YEARS and have yet to find one that I like better. what color is the lamp shade? BEST ANSWER: Lamp shade is white with a hint of ivory (meaning not bright white). 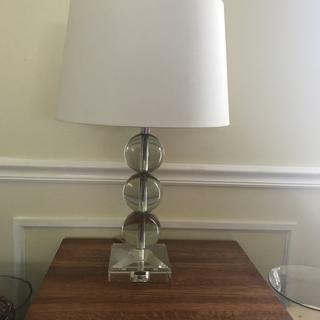 This lamp is heavy and solid and beautiful. I highly recommend it. Nicely made and it came delivered perfectly, not one chip or any damage. I also love the finial included for the top of the lamp. Perfect for living room end tables! We’ve had 2 of these in our living room for 4 years now. They look classy and are very sturdy. It was offered on sale at a great price! Very easy to put together.